The SiTP venue has moved from Penderels Oak in Holborn to The Monarch Bar in Camden Town, see: http://hpanwo.blogspot.com/2010/09/bathing-into-history-part-5.html Tonight’s speaker was a Skeptress called Deborah Hyde. She is a fellow-blogger and posts under the soubriquet “Jourdemayne”; here’s her blog: http://jourdemayne.blogspot.com/ . Her blogging-name probably comes from the famous Margery Jourdemayne, a woman executed in the 15th century for witchcraft. Deborah is also joint-editor of The Skeptic magazine, along with Prof. Chris French- MBA Gold (See: http://hpanwo-tv.blogspot.com/2009/09/prof-chris-french-mba-gold.html) Deborah describes herself as “obsessed” with the malign Supernatural, that is horror movie subject-matter like vampires, zombies, ghosts and ghouls. She did look a bit like a witch herself actually. She’s a tall, slender woman and was wearing an ankle-length black dress with a silver belt. One might find this odd considering she’s a Skeptic and so doesn’t believe that the Supernatural is real, but I must say I’ve noticed this before at the ASSAP Seriously Strange Conference (See: http://hpanwo-tv.blogspot.com/2011/09/assap-seriously-strange-conference.html) A lot of the speakers at the conference also looked very similar, dressed in dark clothes with dyed hair and Gothic make-up; even the very Skeptical ones, with similar viewpoints to Deborah. It seems that a passionate interest in the Supernatural is what inspires people to dress in Supernatural-like clothing, but an actual belief that the Supernatural is real is not essential. Deborah’s main job is creating special effects and make-up for the film industry, so she takes her love of all things that go "BUMP" in the night to work every day as well. In fact she displayed some of her horribly realistic zombie masks on the projector for us to see. Deborah then explained where her research on the malign Supernatural had led her. She uses a lot of her own terminology like “unnatural predators” to describe paranormal beings that do harm to humans, like vampires, werewolves etc. She doesn’t like to use the word "vampire" outside of its historical context, which is Eastern Europe. There are many vampire-like phenomena, or “myths” as she described them, reported all over the world; but it’s very misleading to say something like: “the Malaysian vampire” or “the Mexican vampire” because they are historically very different. The whole idea of vampires has been picked up and run with by literature and film, from the aristocratic darkness of Bram Stoker’s Dracula to R-Patz and his teenage romantic activities in the Twilight saga. By now a lot of the SiTP patrons had ordered their meals and so I noticed a few of them drop their cutlery and turn a bit green during the next part of Deborah’s speech. Where do vampires come from? According to her, what used to happen was that ignorant and superstitious villagers used to blame their problems on the unquiet dead, usually a troublesome member of the community who’d recently passed away and so they would go to the graveyard and exhume his or her coffin. To their amazement they would often find that the corpse of the deceased had not corrupted, even after several months post-mortem, and that fresh blood would be oozing from their nose and mouth. In truth this was because the people didn’t understand that there are many factors in determining how quickly a dead body decomposes, like ambient temperature. Many reports of vampirism occurred in the winter when the soil might be very chilled or even frozen solid, so preserving the body until spring when it was warm enough for the bacteria and worms etc to get to work. The blood seen coming from the body was not blood but sludge caused by the body’s internal bacteria consuming the flesh and excreting the remains out of the orifices; it’s brown in colour, not red, but in the darkness of a cemetery the difference might not have been noticed. The villagers would often then pierce the body with a wooden stake and an audible groan might be heard. This has happened to me at the hospital, and as frightening and unearthly as it might seem it doesn’t mean that the person is still alive… or even undead, but that the gas created by the bacteria bursts out through the larynx making a sound. In the set and setting of a spooky graveyard you can imagine what effect that would have on the witnesses! I do question whether this really does explain the entire vampire phenomenon though, as Deborah claims it does. This is because of the widespread nature of “unnatural predators” of this kind all over the world. Earlier in her speech she warned us only to use the word “vampire” in its proper historical context, but is it really such a misnomer to talk about vampires from other climes? I’ve done some of my own thorough and in-depth research on the subject… in other words I Wiki’ed it… and I’ve found that although vampires were popularized in the 18th century the concept of violent, blood-drinking spirits goes back to prehistoric times. It’s also found the world over from Ancient Greece to Jewish lore, from India to Africa. Also, most curious of all, we have a direct modern incarnation of this archetype, from a non-literary source: the Chupacabra of Latin America. This is a beast that is often interpreted as an alien or cryptid, but it has the same attributes as the more familiar classic vampire. See: http://www.youtube.com/watch?v=SmHmnfgON4A (Not that this video is definitely genuine!) Also not all societies dispose of their dead through burial, meaning that the situation of uncorrupt, bleeding bodies being dug up out of graveyards cannot be universal. In India the Hindus very famously cremate bodies on an open pyre. In parts of Africa it’s quite normal, and even considered respectful, to hold a massive party when somebody dies and cannibalize the body as the main course of the feast. (I wanted to bring this subject up in the Q and A, but a few people were still eating and I thought they’d been put off their food enough already!) So I think there’s a bigger case to answer here than the one Deborah laid out. Another subject Deborah covered was sleep-paralysis. This is when you become half awake after sleeping; you might find yourself lying in bed, able to open your eyes and look around you, but frozen solid and unable to move. Along with your real surroundings you may see strange and ghastly Paranormal beings by your bedside. These beings may well attack you, causing you pain and terror. 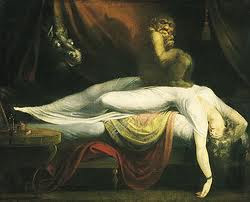 They might sit on top of you, like the beast in the painting Nightmare by Henry Fuseli at the top of this article, or they might even sexually abuse you! Deborah suffers from it herself a lot and has learned to cope with it. Richard Wiseman- MBA Bronze discusses this in his latest book Paranormality, which I’ve reviewed here: http://hpanwo.blogspot.com/2011/04/paranormality-by-prof-richard-wiseman.html . According to both he and Deborah, this is caused by a sleeping disorder that strikes most people on rare occasions. The mechanism that paralyses your skeletal muscles during sleep continues to operate longer than it should when you begin to wake from sleep, meaning that your dreams continue into the period when they ought not to. I’ve only once had sleep paralysis, but I’ve often had hypnopompic experiences. I made a short HPANWO TV film explaining about this, see: http://hpanwo-tv.blogspot.com/2011/04/bedroom-ghost.html . At the interval I went up to Deborah and told her about my experience and she told me that I’m “quite normal” and that she’s been afflicted by this as well, only in her case she saw dancing mice! A neat solution, you might think, and it makes sense for much of reported experiences, however my own encounters with ghosts, or ghost-like phenomena to be exact, do not all fit in with Deborah’s model. Although I concede that the ghost in my bedroom could do, the same could not be said for the event in the park which is the subject of this film: http://hpanwo-tv.blogspot.com/2011/04/ghosts-in-park.html The event in 2008 on a train also evades the Skeptical explanation, see: http://hpanwo-voice.blogspot.com/2008/10/real-ghost-train.html , I swear I had definitely not seen the photo Ustane showed me beforehand. Also I’ve seen ghostlike phenomena when I’ve been wide awake, see my Ghosts in the Park film above. A key element to the park sighting was that I had an independent witness, Jenny. In fact I must be one of the few blokes who’s ever been dumped by his girlfriend because of a ghost! I guess I’ve got an axe to grind. I’m glad I went to this SiTP and I’d like to thank Deborah and all the organizers for a grand evening out. I had some interesting conversations while I was there too. Although Frenchie- MBA Gold, Marmite-Lover, Syd, Dave Green (see Jack of Kent in the Links column) and many other people I know weren’t there I said hello to James O’ Malley of The Pod Delusion, see: http://poddelusion.co.uk/blog/ I sat next to a man called Dave who is new to the Skeptic Movement and didn’t know anybody there. I assured him that he needn’t be alone and probably won’t be for long; Skeptics are by nature a herding species and there’s a very tight-knit and active social life associated with Skepticism. I also was asked by a young couple at the bar before the SiTP began, while the organizers were setting up: “What’s going on here then?” I explained and the woman asked “What is a Skeptic exactly?” That Million Dollar Question again! One that I’ve been trying to answer for years. I decided to be honest with her: “I’m not exactly sure. They claim that they are people who use science and rationality to decide what’s right or wrong instead of religion, mysticism and intuition.” I’m glad I began with the “they claim” bit. I address the question in my review of TAM London, see: http://hpanwo.blogspot.com/2010/10/tam-london-2010.html . In fact this has been a conundrum that has obsessed me! At the British Humanist Association Conspiracy Theory Conference, see: http://hpanwo.blogspot.com/2011/09/british-humanist-association-conspiracy.html , I asked the speakers a sarcastic question about doing a study to find out the psychological profile of the Skeptic, but really it’s a serious matter. What is a Skeptic? What drives them? What makes them tick? The word is spelt “sceptic” in the dictionary, with a note that the word can also be spelt “skeptic”, and it merely means “one who doubts, who does not believe”. However my confusion over the definition is why I always spell the word with a K and also make the initial S uppercase. For me a sceptic is one thing, but a Skeptic means something entirely different. (Marsh from Righteous Indignation (qv) has a radio show of his own called Skeptics with a K, see: http://www.merseysideskeptics.org.uk/podcasts/) As I said when discussing TAM London, their own description of themselves: “A skeptic is one who… rigorously and openly applies the methods of science and reason to all empirical claims… A skeptic provisionally proportions acceptance of any claim to valid logic and a fair and thorough assessment of available evidence, and studies the pitfalls of human reason and the mechanisms of deception so as to avoid being deceived by others or themselves". This is not a description at all, this is a slogan. There are many people who use science and reason, including many highly qualified and experienced scientists, who would not be described as Skeptics; in fact they’re usually labeled “believers”. Then again there are people who know nothing about science and never use its methods who say things like: “Nah, I don’t believe in all that crap! There ain’t no such things as ghosts or UFO’s. It’s all in yer head innit?” Yet this person would be described as a Skeptic. So it’s impossible to avoid the fact that it is opinions and conclusions about certain subjects that separate people called “Skeptics” from those called “believers” or “non-Skeptics” and nothing else; not methods, not science, not education, not qualification. As for what drives them? An equally good question. I wish I could get inside their heads! Maybe I could find some way to become a Skeptic for a day; better be careful though, I might end up liking it! One thing that I’m now convinced of is that MBA plays a major role in their society, whether they are aware of it or not. See here for more details: http://hpanwo-tv.blogspot.com/2011/02/bbc-horizon-mba-city.html and: http://hpanwo-tv.blogspot.com/2011/09/british-humanist-association-gets-its.html . To be an MBA Laureate does indeed mark one out as superior, both in one’s own mind and in the eyes of others. To a dedicated MBA-er, others are weak and unreasonable; they’re guilty of wishful-thinking. “But I can face it! I know I’m going to cease to exist when I die but I can face up to that! You inferior non-MBA-ers need this comfort-blanket myth of an Afterlife, but I have the strength, the courage, the manliness and general superiority to get through my day without that crutch!" It must be an extremely intoxicating feeling… Yes, it’s just as well that I can’t become a Skepper for a day! There’s something else I’ve learnt from my study of the Skeptic Movement: That there’s a great deal of difference between proving somebody wrong and beating them in a debate. In fact the two activities are entirely separate and require a completely separate set of thoughts, mindsets, and skills. What a lot of non-Skeptics don’t understand is that this difference exists; they see debate between Skeps and non-Skeps in the same way as they do internal Woo debates, as a simple weighting up of information on a scale of evidence. It’s not. A Skeptical debate is far more like a verbal fencing match, one which requires training, expertise and natural ability. There are famous organizations where you can train, like the Oxford Union. There are also books which teach you the basics, some are very old ones like The Art of Being Right by the famous philosopher Arthur Schopenhauer, see: http://coolhaus.de/art-of-controversy/ That is one very ironic title! (Maybe Schopenhauer intended it to be) It’s ironic because if you become well-versed in these skills you can win a debate when you’re completely wrong against somebody who is completely right. Of course quality of information is a factor in any debate, even with the most skilled disputant, but as this sport develops, quality of information is becoming more and more auxiliary; it's only a matter of time until it becomes superfluous. A good place to learn about this subject is to spend some time on the Skeptic forums, like JREF, see: http://forums.randi.org/forumindex.php It’s best to just lurk if you’re a newcomer because if you dive straight in you’ll get a bloody nose in no time! One Skepdebater (a word I invented) that I truly admire is “Dr B” from the UK Skeptics Forum, see: http://www.ukskeptics.com/forum/showthread.php/2074-More-near-death-nonsense (I think that this is Dr Jason Braithwaite, see: http://bham.academia.edu/JasonJBraithwaite) not that I agree with him; in fact I totally disagree with him, but I admire him as a world-champion, Gold Medal Skepdebater (He also holds the MBA Silver). I merely enjoy all this as a spectator sport, like a football or basketball fan. As you’ll see, Skepdebating is the lifeblood and cornerstone of the Skeptic community. I don’t know of many of my fellow Woo’s who can match the most elementary forum Skeptic in this art. A good research source is Christopher Hitchens. Hitchens is not a true Skeptic, but rather an “Atheo-Skeptic” (I’ll explain in a future article!) However he is a man who is a prime and extremely interesting example of what I mean when I talk about the art and sport of debating, so much so that he hardly needs an introduction. Here, watch the title-holder prizefighter at work: http://www.youtube.com/watch?v=_R-SjC3lTWk . There are hundreds more of him online. In his autobiography Hitch 22, he describes how he can’t bear to lose a debate. One thing’s for sure though, he’s always going to be tested; he's made certain of that! I must say I do question his sincerity. After reading two of his books and hearing hundreds of hours of his speeches I wonder how much of what he preaches he really believes. He's also stated some very contraditory sentiments about the Military. Hitchens is a man who lives for the debate. Debate is an art form to him, one of which he is the virtually invincible grandmaster; it’s not a means for him, but an ends in itself. His opinions seem tailor-made to ensure that he can get a wrangle out of anybody. He’s a Left-winger who supports the war and he’s an atheist who opposes abortion. All his positions are perfect to make him the universal contrarian. He may not be a pure Skepper, but he has a Skepper’s mind when it comes to the table. 1. Demand evidence from your opponent for everything he says, but when he delivers demand more. And when he delivers more demand even more. Remember, your thirst for evidence must be unquenchable! 2. Use the word "onus" as many times as you possibly can. 3. Always accuse your opponent of failing to read your posts properly, even if he reads them correctly to the letter. Better still, write in a synthetically nebulous style to confuse him and them blame him for not reading it properly. 4. Say: "That old chestnut again!" whenever somebody gives you information you've never heard before. 5. If somebody provides any evidence that cannot be immediately verified on the spot with a form signed in triplicate, denounce it as a fake for lack of evidence. If the poster then provides the triplicate form, go to Rule 1. 6. Use Occam's Razor a lot. The problem-solving exercise which states that the simplest solution should always be tried first. When your opponent asks inconvenient questions like: "How do you know what is more likely than something else?" throw your rattle out of your crib in his direction like there's no tomorrow! And then end the post with "Hope that clears up your misunderstanding of Occams Razor"
7. Another good word is "proselytize". But only use it if you're Christopher Hitchens. "(Insert name here)'s work has been comprehensively discredited!" You must say this whether it is true or not. Even say it if you've never heard of the person your opponent mentions! Never explain how it has been discredited or who did the imaginary discrediting. If you do you might give away your advantage! 9. Constantly and scathingly criticize your opponent on matters irrelevant to his argument like his spelling, his contribution levels, his use of smilies, capitalization, grammar, the length of his posts and italics, his use of enlarged text, coloured text, different fonts, ANYTHING! Accuse him of being abusive to other members if he so much as mentions anything that is not 100% subservient! Remember there's no referee on forums so pick up the ball and run with it! Make sure the moderators are all fellow Skeptics so that you have complete control of forum discipline. Skeptics must be judge, jury and executioner. This means that you allow the Skeptic members to treat the non-Skeptic members any way they please: be rude to them, criticize them and abuse them mercilessly. Twist every rule to suit yourself. Twist every word your opponent says to suit yourself. Gang up on them and make their life pure hell! 11. Be genuinely funny sometimes like Richard Wiseman. 12. Invent new words like "Paranormality" and write books with the word in the title. 13. Make sure that your favourite animal is the Pink Unicorn! 14. If you've won the Materialist Bravery Award then say so in your signature. 15. If any member suggests that Atlantis might be true, even if there's a remotest possibly, that it might be true; or that the Egyptian Pyramids were not built by people with bronze tools and no iron, wheels, pulleys or levers, then immediately denounce him as a latent Nazi, an AntiSemite, a Holocaust-denier, General Manager of Dachau and all associated labels. 16. If nothing else works, start to wonder about the subjects mental health and show that you're really worried and willing to help. Having such outlandish and unscientific views are a sure sign of mental illness. Preferably psychotic schizophrenia or some other severe mental dysfunction. 17. Practice "dissection quoting". This is where you split a quote into multiple segments and write a brief reply to each one. This causes your opponent more difficulty and effort in reading them; and it makes him feel more intimidated. It will make him think: "Oh no, this guy's going through everything I say with a fine-toothed comb! I can't get away with any sleight of speech at all! I'd better watch my step!" Example: You're opponent writes: "I'm not saying for sure that ghosts are real, but I have seen them many times in my house and at work." This is a forum so you're writing, not saying. You use the word "ghost" but this is misleading. You don't know that they are "ghosts", and anyway, please define the term "ghosts"
Define real. Real in the mental sense or the physical? What do you mean by "but"? The word "but" implies an exception to the statement made before. Don't use the first person; there may be more people involved. "Have" or "are"? You appear to be taking part in this experience in the present so use the correct tense if you please. I thought you said there was just one! Many is not a number that a proper rational, empirical scientist can use to determine frequency and therefore generate statistics. I hear so-called "ghosts" appear to the deluded more in caravans than houses. Anyway, bungalows are top of the list so how many floors has it got? Well the way you suffer from this delusion of yours is related to the kind of work you do. Go see a working doctor and kindly stop wasting our time! 18: Use Forced Overreaction. Undermine your opponent by pretending to be very angry or very hurt over everything he says. Twist any words he utters and make them out to be insults. For instance if he writes: "You must be kidding if you think the Roswell craft was a weather balloon!" Then whine and squeal like a hypersensitive prima donna! Accusing him of being a troll, flag the post and reply: "How DARE you accuse me of "kidding" Kidding implies that I am viciously and maliciously lying!" And remember Number 10 above? The Moderator will be a fellow Skeptic and back you up by reprimanding the member: "Do not accuse other forum users of viciously and maliciously lying unless you have evidence! Is that clear!? Do that again and you'll be BANNED!" 19. Try to drag any conversation round and round in circles. This is very easy on a forum where Skeptics are the majority and the Woo's are outnumbered. What you do is wait until a certain aspect of the discussion hasn't been mentioned for 20 or 30 posts and then suddenly bring it up again! It doesn't matter if you were proved wrong the last time it was made; your opponent will probably have forgotten. Keep doing this until your opponent simply grows weary and quits the thread. In this way it will conjour the illusion that you have won the debate, even if you've lost. 20. Write in a way that illustrates tone of voice in dialogue. This is a very important skill when it comes to Skeptibaiting your opponent. Your opponent must feel as if you are speaking to him, in the same room, in his face so he can't turn away. An example is to turn written words into dialogue like "yes and "no" by writing "yup" and "nope" instead. If used in just the right place doing this is very effective. 21. "Diddying". This is related to number 20 in that it's a way of making written words sound like spoken, but this is by far the most powerful example. This dialogue-writing is one of somebody dancing around in a circle in a laughing, but very angry way, with tension. There's a element of gloating and contempt too which is all part of being a Forum Skepper. The "Diddy" is best used in conjunction with the word "wrong" (More on this word itself later) You write "Wrong-diddy- wrong-wrong-wrong!" using bold type and smilies galore! This has the power to light the flame of irritation in almost all Woo Scum and I can almost guarantee you'll get a reaction from them which will give the Mod's the excuse they're looking for to move in. 22. Saying "Wrong." Just like that, not as part of a sentence or in conjunction with other words; just as it is on its own. Capital W, full stop! Don't say: "You're wrong" or even worse: "I think you're wrong." No! Just say "Wrong." However, unlike other monosyllabics, "Wrong." cannot be used on its own in a single-word post. It must be followed by a sentence of explanation. 23. Dvarking. Dvarking is related to Diddying, in that it is a way of injecting verbal intonation into a written piece of text; however Dvarking crates a different tone. If used correctly it can enrage and intimidate your opponent more than anything else. But BEWARE! Dvarking, unlike Diddying, can be used by Woo scum against us too. Dvarking is most often employed by academics against each other, but can be used by anybody trained in the art. The basis of Dvarking is to try to make your intonement sound like a mixture of Kenneth Williams and Donald Duck, but very angry; however the anger is controlled and rationed out in even amounts; are you getting the picture? 25. Another brilliant word: "Caveat". It's only recently emerged in the Forum Skeptisphere so use it quick before it becomes another cliché! At Christmas 1980 in Rendlesham Forerst, Suffolk an old man was out walking his dog alone at night when a pyramidal-shaped UFO landed beside him. 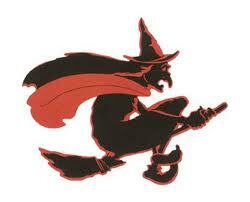 Also red lights were seen by him flying through the trees. This is obviously a stupid and pathetic attempt to persuade us that he saw something truly paranormal! He did not. Why was he the only witness? Surely we'd have had a dozen or so witnesses from the RAF Woodbridge airbase nearby! Why were the security police not sent out to investigate? You'd think that they'd have alerted the base's Deputy-Commander Lt. Co. Halt who was at a Christmas party at the time. Did they say: "Nah, let him get on pulling crackers and singing Jingle Bells!" If the security police were sent out to investigate, and Halt and a group of colleagues went into the woods and saw it, and recorded their experiences on a tape-recorder... then I'd believe it. But this definitely did not... NOT happen so the Skeptic viewpoint prevails again! 30. Provocative repetition. If you wish to post a particularly well-known piece of Skepperistic "wisdom" then post it but afterwards say slowly and with much articulation. "I think that that is so important that I am going to say it again" and then do so. The articulation is very important; avoid abbreviations like: "I think that's so important I'm going to say it again". Here's a good example with one of the Skeptic Movement's best known mantras: "The plural of anecdote is not data. I think that that is so important that I am going to say it again: The plural of anecdote is not data." I've editied this article slightly since I first published it. Ben you really do go to some considerable effort when it comes to skeptics. Sooner or later you will realise we are right all along. Like you said 'where's the evidence'. I see none. Nice article. I just stumbled upon your blog and wanted to say that I have really enjoyed reading your articles. A lot of times it's tough to get that "perfect balance" between user friendliness and visual appeal. I must say you have done a amazing job with this. Also, the blog loads extremely fast for me on Opera. Exceptional Blog! I'm gone to say to my little brother, that he should also pay a quick visit this website on regular basis to take updated from most recent information. to exchange strategies with others, why not shoot me an e-mail if interested. There's definately a great deal to know about this subject. I really like all the points you've made. Did you know that you can create short urls with AdFly and receive dollars for every click on your shortened urls. Looking for the Best Dating Site? Join and find your perfect date. Did you know you can get them ON AUTO-PILOT AND ABSOLUTELY FREE by using Like 4 Like?